We educate each patient so that they can make intelligent decisions about their dental health. Drs. Hendry and Henriod are experts in placing dental implants. One of our main specializations as a periodontal practice is treatment with dental implants. 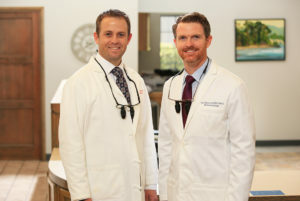 Both Dr. Henriod and Dr. Hendry are very experienced in dental implants and have placed, between them, thousands of implants with a 98%+ success rate. They know what to look out for and how to handle anything that might arise during treatment. 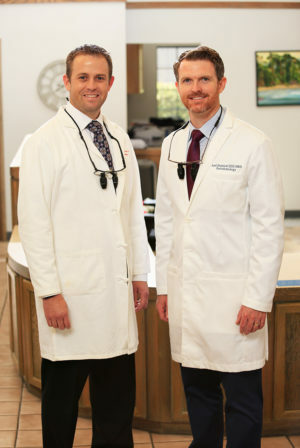 Dr. Henriod and Dr. Hendry are highly sought-after teachers of implant dentistry, as well as being highly trained in it themselves. Dr. Henriod & Dr Hendry have additionally achieved the certification of Diplomate of the American Board of Periodontology, a rigorous training and examination process that only about 10% of periodontists have completed. A dental implant is basically a replacement for a tooth root. Dental implants can be used to replace single teeth, and they can also be used to support several teeth for multiple teeth replacement. Crowns for single teeth replacement. These are usually indistinguishable from natural teeth. They provide the required support for missing teeth to bite and chew as strong as natural teeth, and can prevent bone loss in the jaw. When all teeth are missing, or beyond repair, implants can anchor a set of implant teeth. Each case is individually planned & 4-8 implants are placed in the jaw for a full set of teeth. This is a dental bridge of three to four porcelain teeth supported by two dental implants. We can place implants to support a series of bridges that replace an entire arch of teeth. This is a very lifelike teeth replacement option, with 99% full chewing power and a natural look and feel. Partial dentures retained by dental implants to increase stabilization or a full denture retained by dental implants to increase stabilization are also known as “snap-in” dentures. 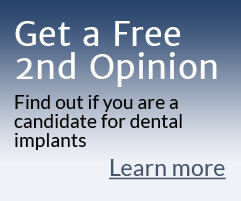 Generally, these use two to four implants to keep the dentures in place. However, they still press on gum tissue and can cause pain and soreness when eating. Snap-in dentures only have about 35% of normal chewing power as the back of the denture still lifts off the gums when eating certain foods. 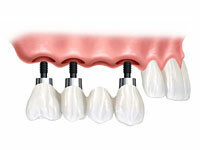 The doctors use four to six specially placed implants per arch to secure high-grade new teeth. Patients walk out with teeth in just one day. These teeth do not snap in and out and can only be removed by the dentist. Chewing power increases to about 80% of normal, and allows most patients to eat whatever they want. Learn more about New Teeth in One Day with All-on-4. Your first step is a free consultation with Dr. Hendry or Dr. Henriod. You will be able to review treatment options and get any questions answered. 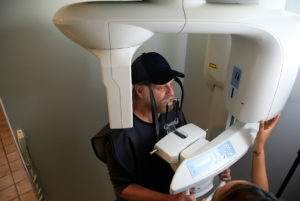 We use an advanced 3D Cone Beam CT scanner when taking X-rays for planning dental implant placement surgery. Your next step is to get full diagnostics. This starts with our state-of-the-art cone beam CT scanner which takes 3D 360º images of your teeth, jaw and related structures. The 3D scanner uses X-rays focused into a cone beam onto the precise areas of treatment. It employs only a fraction of the radiation used by medical CT scanners. We conduct a thorough oral exam and review your dental and medical history. We take other records we might need, such as digital X-rays and intraoral and external photos. We take impressions of your teeth and gums with which to make a study model. Digital 3D X-rays can be used to plan implant placement with advanced computer software. We use 3D software to view and manipulate the 3D images captured by the cone beam. We can see in 360º view the exact position of your teeth, nerves and gums. We measure the bone depth and plot the position of the sinus and nerves and other structures. We use the information gathered, the study model and the 3D imaging to create your treatment plan, including plotting the precise position and angle of the dental implant placement and the size of the implant for best stability and integration. The longevity of an implant is determined to a large degree by how healthy and stable the gums and jaw bone tissue are. Part of our planning is ensuring you will have enough bone and soft tissue to form a lasting integration of the implant and its surroundings. In this step your final restoration is also planned—the tooth (crown), bridge or denture that will be attached to the implant(s). This is done in conjunction with your general dentist or with one of our partner general dentists or prosthodontists (a dental specialist in the replacement and restoration of teeth). A dental articulator can help determine the bite and how its alignment is formed. The placement of the implant is very much tied to their final use. They have to be placed so that when the replacement teeth are attached the bite is properly aligned. We use study models and articulators as in the photo to the right, as well as 3D imaging to plan how the implants should be placed to best accommodate the final replacement teeth. Using our 3D scan we create surgical guides to ensure precision implant insertion. The surgical guide is positioned over the gums during surgery to guide the implants into the most ideal position. This makes the surgery quick, safe and predictable and takes away the risk of nerve damage, sinus perforation and arterial damage. Where extractions are needed, we remove the tooth very carefully, usually in pieces, so as to preserve the shape of the socket and to minimize damage to the surrounding bone and gums. 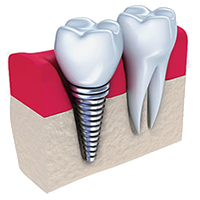 We can usually place the implant immediately after an extraction, which often minimizes healing time. If teeth have been missing for a long time, you will have experienced bone loss. In the first year after extraction or tooth loss, 25% of the bone is lost to bone reabsorption and the bone loss continues. In some cases, bone is lost prior to tooth loss due to severe periodontal disease or infection. Where there is too little volume of bone to sustain an implant, we sometimes have to augment the bone either by doing a bone graft or by augmenting the amount of bone between your jaw and sinus. Often, we can place the bone graft at the same time as the implant, unless the bone is severely compromised. Sinus augmentations (also known as Sinus Lifts) need to be done separately. Thanks to our 3D cone beam scanner, we can sometimes avoid bone grafting despite bone loss. The 3D scanner helps us to find available bone and then special techniques allow us to take full advantage of that bone. Implant healing (full integration with the bone) takes 3 to 6 months and in order to speed the healing, we control various factors such as placing the implant straight away after extraction. An important factor determining speed of healing is how precisely the dental implant is placed, causing the least amount of impact on the surrounding tissues and bone. Our extensive planning and preparation, use of surgical guides, and controlled drilling ensures a very precise insertion. For patients who have problems with healing or who opt to have less bone grafting, we can use a newer type of dental implant that integrates faster with the bone. These are called trabecular implants, a mixture of titanium and tantalum. The cellular structure of trabecular metal resembles that of bone and more closely resembles its properties than other prosthetic materials. Its structure promotes rapid and extensive tissue integration and strong attachment. We have a very high rate of success with our dental implants. Nevertheless, if your dental implant should fail despite following proper care instructions, we guarantee to place a replacement implant for no extra charge. We offer IV sedation for the more nervous or anxious patient to give them a more relaxing and comfortable experience. 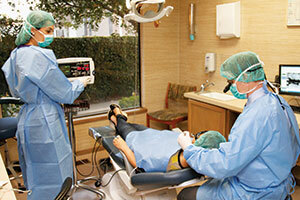 We know that any kind of dental treatment can be trying or even traumatic for the patient. We provide a variety of amenities to keep you comfortable throughout the procedure. All our procedures can be done with local anesthesia only, but any patient can opt to have oral or IV sedation to help them relax. You will also find our doctors and staff very friendly and reassuring. They will fully explain the procedures ahead of time and make sure all your concerns are addressed and your questions answered. Learn more about our Comfort Amenities and Sedation. After your dental implant or implants have been placed, you will immediately get some kind of temporary tooth or teeth. Once the implant(s) has fully healed, your general dentist will place your new tooth or teeth as designed in the preliminary planning step. We offer a Complimentary Dental Implant Consultation to assess what would work best for your situation, review treatment options and answer any questions. 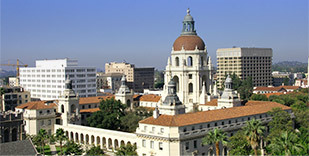 We will present you with treatment plan options that take into account your budget and lifestyle.